Jane Pine is a local artist who lives within Dartmoor National Park with her husband and two children. 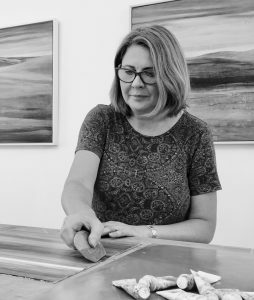 After returning to education in 2014 as a mature student, Jane graduated from Plymouth College of Art with a first class BA(HONS) Degree in Painting, Drawing and Printmaking. 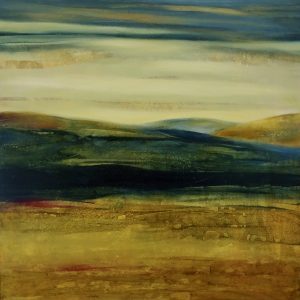 With many years experience in painting using traditional materials and more recently encaustic techniques, she currently uses a subtractive method derived from mono- printing. Her work has a narrative beyond what is on the surface and explores themes developed through a process of personal and emotional responses to everyday experiences. Through subjects such as landscape, everyday objects and figurative, Jane seeks to create a mindful, contemplative space for the viewer to emerge into consciousness, to the inner spaces of reverie and meditation. Jane uses real life experience of the local landscape, where she has developed a deep emotional connection to its wild open spaces. Her work conveys a visual language and a personal sense of place through subtle multi-layered surfaces, to create a sense of the vast open spaces and woodlands of Dartmoor. In June 2017 Jane won the Emerging Artist Award from Devon Artist Network for excellence in painting.